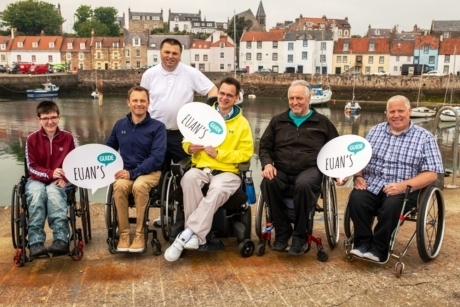 Euan's Guide, a charity website used by disabled people to review, share and discover accessible places to visit, has launched an online accessibility guide to Fife. The guide to one of Scotland's most popular regions features a range of accessible locations, from the home of golf, St Andrews, to Fife's famous sandy beaches and its picturesque fishing villages. The Fife guide is free and downloadable from www.euansguide.com/fife-guide. It is being promoted with a series of digital postcards showing just how accessible the region is for disabled visitors. Group travel organisers who run trips for people with physical disabilities will find a number of inspirational trip ideas to suit many abilities, from wheelchair accessible red squirrel trails to accessible beachside tracks. The digital guide features three of Fife's most iconic locations: the coastal village of St Monans, which dates back to the 14th century; St Andrews, home to golf and famous for West Sands Beach which featured in the film Chariots of Fire; and Kingsbarns Distillery, a former farm building turned malt whisky distillery. Other activities and things to do include heading to the Scottish Fisheries Museum and the Anstruther Fish Bar and Restaurant in Anstruther; visiting the Carnegie Birthplace Museum in Dunfermline; and heading to the Scottish Deer Centre near Cupar for a wheelchair accessible day outdoors. There are also lots of ideas for accessible accommodation, and animated maps to use during your visit. Euan's Guide was founded in 2013 by Euan MacDonald, a power chair user with Motor Neurone Disease, and his sister Kiki when they were looking for recommendations of accessible places to visit. The website features thousands of friendly and honest disabled access reviews and listings in the UK and internationally.